Air Quality Engineering, Inc. offers both self-washing and manual wash in-duct electrostatic air cleaners for commercial kitchen or restaurant exhaust. Rooftop or interior mounted exhaust units, both versions are available in multiple sizes and are designed to be modular to fit any sized job with any degree of efficiency necessary. Activated carbon modules, blowers, outdoor enclosures and master clocks are all available and customizable to meet the specifications necessary for each installation. All this comes together to provide a clean air environment for your employees and guests. The F61 AUTOCLEAN® features a dynamic wash system that uses a multi-jet wash manifold that both rotates and traverses the electronic collector cells to ensure complete coverage and maximum wash results. 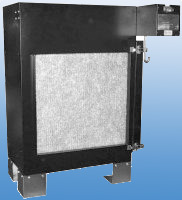 Many competitive kitchen exhaust units have a fixed wash system that sprays the collector cells with fixed spray nozzles that can’t get adequate coverage into the depths of the collector fins which results in incomplete cleanings, lower operating efficiency and more frequently required cleanings. Included sequence controller is user-adjustable allowing control over the amount of detergent used, length of shut down, wash and rinse cycles. Complete kitchen exhaust packages for the electronic air cleaners are also available that include rooftop skid, outdoor insulated weather enclosure, lifting lugs and all necessary transitions. The F61 AUTOCLEAN® offers impressive restaurant kitchen exhaust performance with a comparably lower price than electrostatic air cleaners offered by the leading competitors. The F72 series in-line electronic air cleaners offers commercial kitchen exhaust functionality with the same high efficiency performance as the F61 AUTOCLEAN® electrostatic cleaner but without the self-wash feature. The F72 exhaust unit is ideal for in-line restaurant exhaust systems that are lighter duty in nature and don’t require frequent cleaning. The F72 is also offered with rooftop exhaust packages and customizable to meet any size or efficiency requirements. Also available with activated carbon modules for odor filtration. Click here to view our Kitchen Exhaust Brochure. Don’t forget, we also carry replacement parts for our commercial kitchen air filtration systems. Take a look at some of the air filtration systems that we built for a variety of commercial kitchen customers here. Also, check out our latest article on what you need to know about commercial kitchen exhaust systems.